In 2009, the City of Virginia Beach added Medically Friendly Sheltering (MFS) to our city shelter plan. EMS was identified as the lead agency and began the daunting task of identifying sites, writing contracts, obtaining equipment, identifying staffing, and drawing up plans to operate an MFS. Medically Friendly Shelters are incorporated into shelter plans since there are so many citizens in their homes with special medical needs that may not be easily managed or require special resources such as electricity or oxygen. Sheltering should be a very last resort for everyone with or without medical needs. Everyone should have a plan—places to go, back up plans, food, water, medication, supplies, etc.—but sometimes plans fall through or an event is unexpected. MFSs are not nursing homes and are not designed to fully care for guests. Residents should bring all equipment, medications and supplies that they require. If they require assistance with daily living, a caretaker must join them. The shelter medical staff is made up of nurses, aides and respiratory therapists to assist guests with their situation and monitor them. There are some supplies in our cache to aid the medical staff in assisting the guests. In 2011, we tested our plans with a full scale exercise at the Virginia Beach Field House. This public/private partnership was established specifically to house the “large” MFS (300 MFS guests) for the city. Hurricane Irene caused us to open our “small” site later that year at Salem High School for a real event. We were open for 42 hours and housed approximately 120 guests (including non-medical). 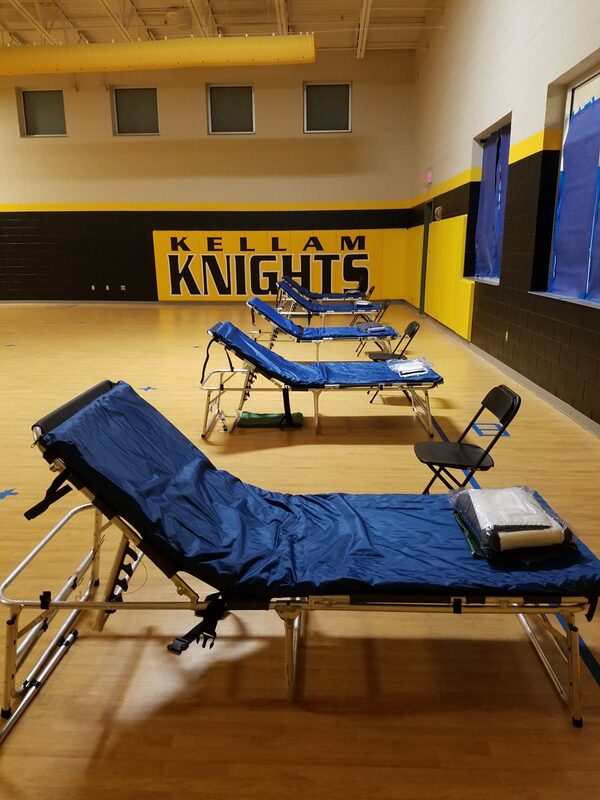 The newly constructed Kellam High School was identified as the new small footprint MFS (50 MFS guests) and we did a small exercise in 2017 to identify layouts and setup. In 2018, we exercised the Field House again. Time had passed and we were able to think through many items learned from the first exercise and deployment to make it even better. 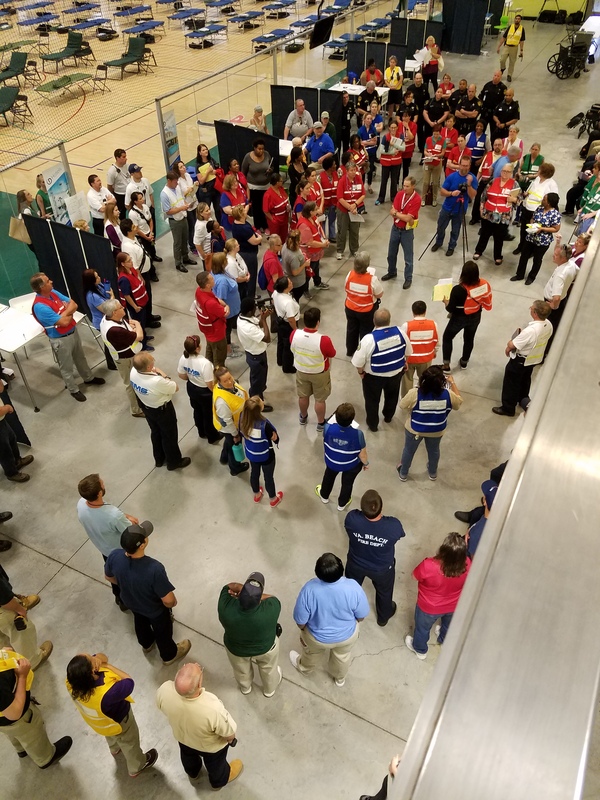 True to form, we had a real event shortly after the large drill and opened the Kellam MFS for Hurricane Florence in 2018. We housed approximately 52 guests for around 48 hours (including non-medical). This is a relatively new experience for all involved, it isn’t something that EMS usually handles and it is a rare occurrence. There are so many agencies, people, and moving parts involved. As EMS providers, you might be tasked to assist with the MFS set up, operation or break down at either site. Setup and breakdown would involve loading or unloading all of the gear to operate, setting up tables and chairs, hanging signs and cleaning up. It takes 6-12 hours to set up/break down depending on the location. While the shelter is open, we still need logistics personnel to manage the supply cache, EMS staff to standby in case of a medical emergency, an ambulance crew in case there is a transport need and other roles to operate the facilities. During the entire process, we require runners, assistants, aides and staff to document everything. These roles are in addition to the DHS staff, deputies, facility staff, and the nurses and other staff who tend to the medically fragile guests. Over 50 staff members are required per twelve hour shift for the smaller shelter and over 70 per shift for the Field House just to operate. If you are assigned to the Emergency Care Unit in the shelter, you will be our in-house 911 to handle for medical emergencies. Shelter standby ambulances can assist and are usually cycled through. While standing by at the shelter, you will work with the Emergency Care Unit. Other staff might be assigned as runners, aides or help with documentation. If you are and EMS provider tasked to the MFS shelter as an event assignment, you need to bring food, water, clothing, toiletries, bedding, medications, and any other supplies you might need over a 72 hour period (think camping indoors). You should plan to stay on site though certain situations may allow you to leave during your off hours. If your family doesn’t have a plan already, they can join you at the shelter but please ensure children are tended to by a responsible adult while you are working. Finally, I wanted to take a moment to recognize everyone who participated in the in the 2018 Hurricane Florence MFS activation. We altered plans, changed venues at the last minute and put people in positions that they are unaccustomed to. Everyone did an amazing job from the EMT students who helped set up all of the equipment to the staff who filled out ICS forms. From the medical staff who staffed the shelter to the deputies and DHS staff who are used to standard shelters and not medically friendly ones. A HUGE shout out, and sincere thank you, goes out to Dr. Smith and the Kellam High School staff for being such generous hosts as we took over their facility. We all learned a lot from this activation and are continuing to refine our process for the next drill and activation. There were challenges that we worked through and it was a great success thanks to all of you!